Another GIF Fight has brought again a bunch of imaginative work created by the original Giffighters and lots of new faces mostly from the ds106 community. I still need to do a proper blog post about GIFFight, but you can read about the origin of the project on Giphy. For now I just wanted to reflect on some of the great work made using the JCVD Funny or Die footage and share a tutorial of how I made my GIF for a friend who asked for help! Jean Claude Van Damme is finally going the Schwarzenegger action hero becomes comedy actor route with a new movie and an even more interesting remix contest hosted by Funny or Die. JCVD recorded a number of short clips in front of a green screen while shooting, kicking, defusing a bomb, and delivering one liners like “They found us! I’ll cover you!” The challenge was from JCVD to the crowd to, “Make My Movie!” And there are some really great films that were made by lots of different people. I particularly liked the Vintage Van Damme Toy Commercial (c. 1997). So with 1.1GB of pre-keyed (no background only JCVD) footage available for remix, I thought it would make for a good GIFFight. We had recently done something similar by collectively participating in the Tate’s 1840s GIF party which led to a lot of great GIFing. But this was the first time we started with video footage rather than a still image to animate. It’s a little against the rules of the GIFFight, but JCVD proved to tempting. Tom Woodward recently drop three awesome JCVD Pink Valentines, but I think Fallin for U is my favorite. And overall I just love Rochelle Lockridge’s Oh Sheep! – GIF humor is always at it’s best when they include animals. Rochelle also summarized the work she created with the JCVD footage and gave a tutorial, which was interesting as it’s very different from mine. So I thought I’d share my as well to build a larger base of GIF remix tutorial knowledge. A lot of it is similar to how I make GIFs for Don’t Turn that Dial, which I shared on Youtube. To open and select a portion of JCVD footage I used MPEG Streamclip. I used to use Quicktime Pro 7, but I’m starting to prefer Streamclip as it opens videos in different codecs without have to convert them first as Quicktime does. Isolate a portion of the clip you wish to use for your GIF by advancing the playhead to start point and press ‘i’ (for the in point) and then advance to the end point and press ‘o’ (for the out point). You can use the left and right arrows to advance forward and back frame-by-frame to be very particular about your edit. And at any time you reposition the playhead and type ‘i’ or ‘o’ the in and out points change. After which, you should see the section you want dark grey in the player. 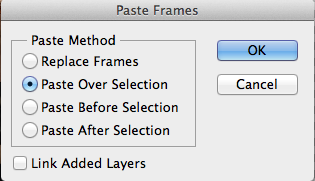 Next select Edit>Trim and then Save As… with a new title. By not exporting or making any changes to the codec, the transparency alpha channel is maintained and now you have the short snippet to import to Photoshop. Photoshop’s File>Import>Video Frames to Layers… gives you the opportunity to create your animation and reduce the number of frames you’ll use to create your animation by selecting even 2, 3, or more frames. For GIFs I’m making for Tumblr (which has strict file size constraints), I’ll generally throw away as many frames as there are seconds in the clip. So for example if it’s a three second clip I’ll set the limit to 3. This will typically give you 30 or fewer frames of animation based on film and video being between 24-30 frames-per-second. Now with the transparent background and the animation working – test GIF at the top of this post – it’s time to add a background. In this case I used a a short clip from an episode of My Little Pony, Friendship is Magic (because who wouldn’t want to see JCVD in Ponyville)! 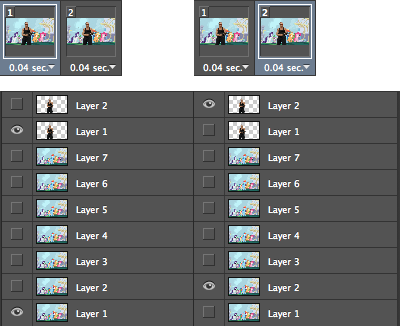 Using the same process I created a second Photoshop file with 7 frames of ponies. Now you need to do a little math to make the animated background fit the JCVD foreground which was 33 frames. 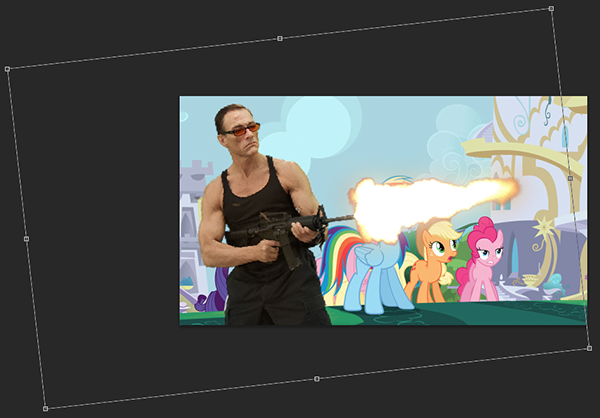 I decided on 2:1 ratio or 14:7 frames, meaning the pony clip would loop 2 times for ever one loop of JCVD shooting. So this required I throw away 17 frames of JCVD which involved highlighting every other frame or so and then clicking the trash icon in the animation timeline. To now add the frames from one Photoshop file to the next you need to highlight all the frames from the foreground clip (JCVD shooting) in the timeline. And then in the timeline menu (circled in red), select copy frames. This will place the 14 frames of JCVD of ponies on top of the seven frames of ponies and create 7 new frames of JCVD with still a blank background. This also creates 14 new layers for ever frame of JCVD in the Photoshop file. You’ll notice as you highlight frames 1-7, you see a pony layer and a JCVD layer are visible. So for frames 8-14, highlight each frame and then make visible the corresponding pony layer to complete the loop. For example highlight frame 8 make visible pony layer 1, highlight frame 9 and make visible pony layer 2, etc. It’s a little tedious, but you get through it. Also realize it’s possible to resize and reposition the entire background or entire foreground using the Edit>Free Transform or Edit>Transform. I described this in how I make GIFs for my Don’t Turn that Dial GIF project. Just highlight all the layers of the foreground, then choose Edit>Free Transform. You can then resize and reposition. This is particularly useful if the media sizes of the foreground and background don’t match. Or you just want to make JCVD bigger! To create the rainbow effect over the burst of flames coming from the M-16, I drew in two new layers two versions of the rainbow. I then alternated between them for every other frame. But to have them stay connected to the end of the gun, I also nudge the layer using the Move Tool. Unlike Free Transform, if you adjust the position of content in a layer between frames using the Move Tool each frame records a different position of the content. And to have the rainbow blend with the background the layer, I changed the blending mode to dissolve and/or hard light. This was the final result! Oh and I forgot painting the bullets rainbow was as you can imagine slow and tedious, done frame-by-frame, but totally worth the effort.